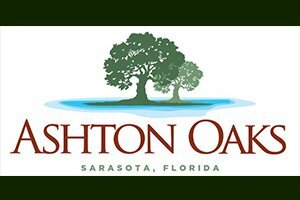 Ashton Oaks is a close-knit community of just 20 single family residences off McIntosh Road between Proctor and Ashton Roads in south Sarasota County. 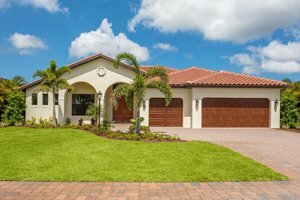 Marketing of Sarasota homes for sale in this community started around February 2015 shortly after its groundbreaking in December 2014. The community’s development has been well received in the market. Moving towards the last quarter of 2017, only four Ashton Oaks residences are left unsold. The warm market reception of Ashton Oaks homes for sale is directly attributable to the superb track record of their developer, the Sarasota-based U.S. Assets Group and its unit Heritage Builders. Both have been constructing award-winning custom homes and developing boutique communities in Florida for close to 20 years. Ashton Oaks was developed as a private gated community with choices on one-fourth and one-half acre home lots. These home sites were platted either backing up to the property’s signature two-acre lake or to lush landscaping that pretty much defines the serene and quiet ambiance of this community. The homes of Ashton Oaks are all lined up along a single street which doglegs northwards to a cul-de-sac. The community’s streetscape is striking with its landscaping buffers and paver sidewalks. From the cul-de-sac, there’s a nature trail leading to a lakeside community gathering area shaded by old oak trees. Heritage Builders has made available three customizable single family home designs for prospective buyers of Ashton Oaks homes for sale. These residences flaunt the sophistication of Coastal or Mediterranean architectural styles with choices on floor areas ranging from 2,600 to over 3,300 square feet. All one-story builds, these residences come in three- to four-bedroom layouts with three baths and three car garages plus lanais and outdoor living spaces. 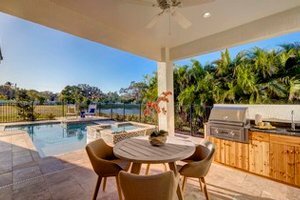 A model home in Ashton Oaks, the Azalea, notably won citations in the 2016 Manatee Sarasota Parade of Homes. This three-bedroom design was adjudged best in architectural detail and best master suite in this annual showcase of the Manatee Sarasota Building Industry Association. Homes for sale in Ashton Oaks are truly impressive with their high-end finishes and features. Heritage Builders offers aspiring buyers choices in either ceramic or porcelain tile flooring in its Ashton Oaks builds. Custom hardwood cabinetry, granite countertops and tray ceilings with crown molding likewise form part of these homes’ market draw along with their roof tiles and paver driveways. The few remaining residences in this community are priced in the $500s–$600s range. Proximity to top local schools, including Sarasota Middle and Ashton Elementary both walking distance from the community, make Ashton Oaks a smart choice for young families. It is also a great pick for young professionals pursuing career opportunities, as this community is flanked by major road corridors, such as Clark Road and Interstate 75 leading to many local business centers. Retirees will likewise fit in well at Ashton Oaks not only because of its laid-back and quiet suburban setting. Access to leisure activities is also easy for the community’s residents who, in a matter of minutes, could go and relax at the beaches of Siesta Key amongst other nearby points of interest. Below are the current real estate listings available at Ashton Oaks.